Enter a URL in the field above then click the View Trend Reports button. Our recently redesigned Trend Report will allow you to view vital search engine information about any url that you enter. 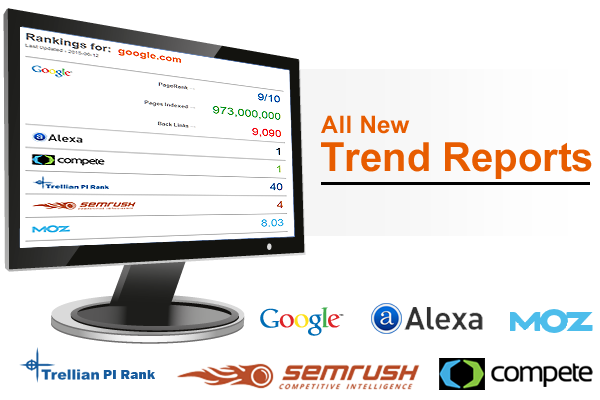 The Trend Report will allow you to see the Url's PageRank, Alexa Rank, Compete Rank, SemRush Rank, MozRank and more. The redesign of the Trend Reports have made them much easier to digest. To generate a Trend Report enter a url into the text field above and click View Trend Reports. This is one of the simplest tools we offer. You enter a URL and we will instantly check the URL and then display to you the HTTP Headers that are sent back to us. Use this tool to quickly check the availability of your domain with a variety of extensions. The Keyword Suggestion Tool is extremely helpful as keywords are the foundation of all search engine optimization and search engine marketing campaigns.